As we start to approach warmer weather, that also means it is getting closer the start of grilling season or maybe it has even started for some of you living a bit further South. While recently it has gotten cold again here in the Northeast, this past weekend it was up to near 80 degrees and it really started to feel like the end of Spring or beginning of Summer. While you can always use the oven and the stove to cook things, nothing can beat the taste of grilling in my opinion. Most of you probably have a gas or propane grill if you are grilling often as it is simpler and easier to start. But when I’m travelling I always use a charcoal grill and I know a lot of people do use charcoal and might even enjoy the flavor that brings over the gas grill. In this post I’m going to share with you something that will make your life easier when using a charcoal grill, and save you some money. This is my charcoal chimney review, and if you have never used one before you need to get one! If you have ever grilled with charcoal before, you have probably experienced the pain of trying to light it with lighter fluid and then waiting for all the coals to light and the lighter fluid to burn off so you don’t get the taste or chemicals on your food. Even if you buy a match light or quick light version, you still have to wait a while for that to burn off. So now I introduce to you: the charcoal chimney. While this won’t magically eliminate the need to wait for your coals to get hot, it will completely eliminate the need for lighter fluid! A charcoal chimney is really, really easy to use as well. You turn it upside down, and crumple up some newspaper or any paper really and place it in a circle at the bottom packing it tightly in. Then you flip it over and dump the charcoal into the top part of the chimney. After that all you have to do is light the paper on fire and wait for the magic to happen! Once the coals near the top start to ash over and you can tell they are lit, you can dump your charcoal over and start grilling. 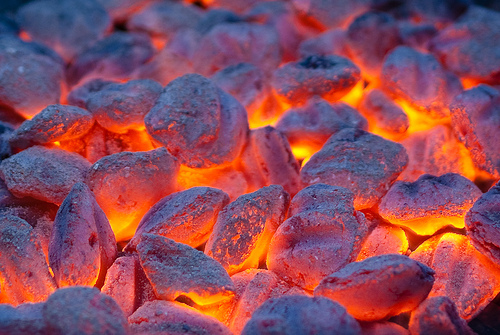 If you need more charcoal you can even just lay some more down on top of the already lit coals. Absolutely no lighter fluid required. A little secret tip for making this work even faster is using a single piece of newspaper and drizzling a few drops of vegetable oil on the newspaper before lighting it. When it comes to cost savings, let’s assume that you can get a 64 ounce bottle of lighter fluid for around $7. Most lighter fluids recommenced that you use 1.6 ounces of lighter fluid per pound of charcoal, so that gives us around 40 uses for that $7 bottle. You can get a a normal sized charcoal chimney for around $18 and then a smaller version for around $12. After a certain amount of times you use the charcoal chimney, it will pay for itself from the cost of lighter fluid. The break even period will definitely take you a while, probably even a few summers but you will reach it eventually. I have been using my charcoal chimney for 3 years now and it’s really no worse for wear and is not showing any signs of slowing down. It has most likely paid for itself and I was really amazed at how easily it worked. When I first looked them up, I really thought it was going to take forever to light or maybe sometimes the charcoal wouldn’t light but it worked perfectly the first time and has worked perfectly ever since. I hope you enjoyed my charcoal chimney review, and I really think it’s good value here. Remember that being frugal doesn’t mean you always buy the cheapest thing it’s finding the best value for your money so that your dollar takes you further. Even if you only grill a few times a year, I highly recommend looking into a charcoal chimney. I personally use the Weber Compact Chimney Starter, but I’m sure the full sized one and other brands work just as well!